Roger Hirst became a PADI DM in 1994 and a PADI Instructor in 1995 and has taught over 900 divers all over the world before setting up Dive Wimbledon in 2003 with Jane. Roger loves to teach absolute beginners to see their faces when they realise just how much fun diving can be. 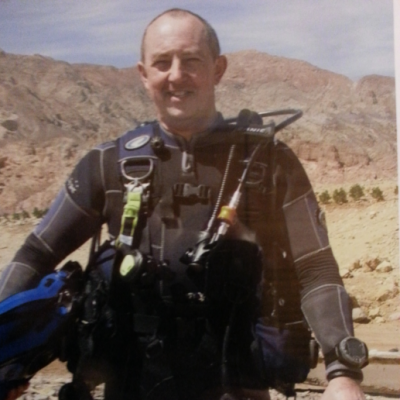 Geoff Creighton is Dive Wimbledon's PADI Course Director. 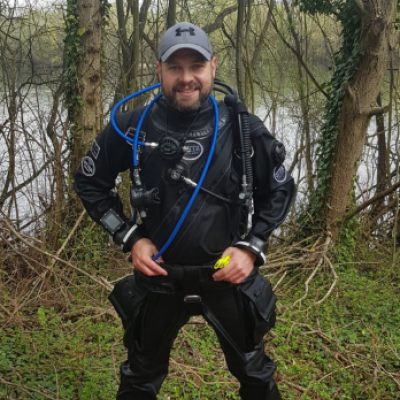 Learning to dive as a teenager over 20 years ago, Geoff represents a new generation of instructor trainers active in the UK. 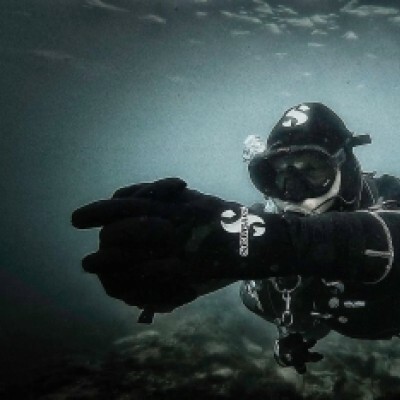 His wide-ranging dive experience, along with a progressive approach drawn from his technical diving and work in digital media, inspires candidates to become modern recreational and technical dive instructors. 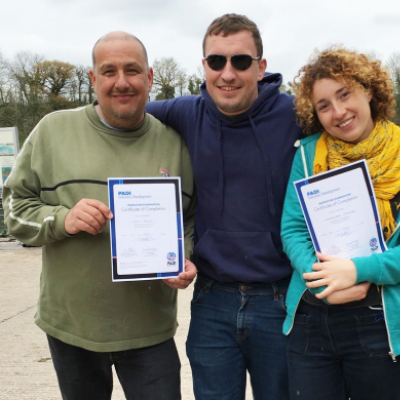 After many successful Instructor Development Courses, he holds a 100% pass rate for candidates becoming qualified at the independent PADI Instructor Examination. 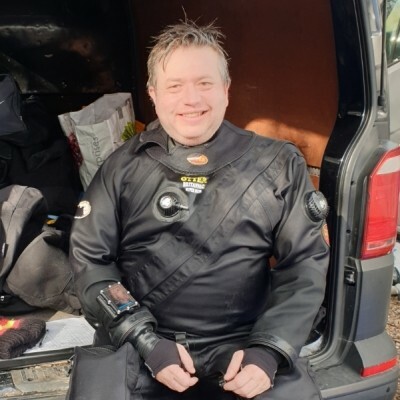 Geoff is factory qualified to teach a number of leading rebreather models including the SF2 and Hollis Prism, and enjoys deep technical, advanced wreck and expedition-level diving. 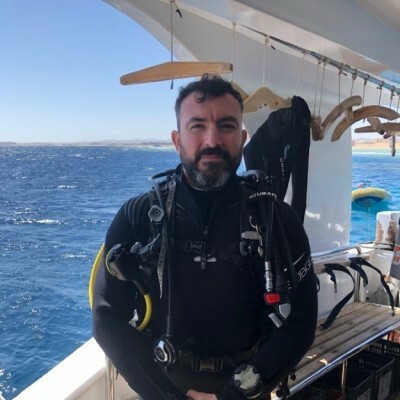 Geoff has worked on a number of significant movie projects as rebreather consultant to the production, instructor to cast members and a diving double. His most recent assignment was training and supervising Simon Pegg, diving a rebreather for a stunt in his role in the 2018 blockbuster Mission: Impossible Fallout. He also had a significant hand in the underwater exploits for Gerard Butler's recently released submarine action, Hunter Killer. Pete Tomkins learned to dive in Cozumel in 2008 and since then he has completed all his courses with Dive Wimbledon up to Divemaster level. In 2010 he became a PADI Instructor and since then has progressed on to Staff Instructor and now Master Instructor. 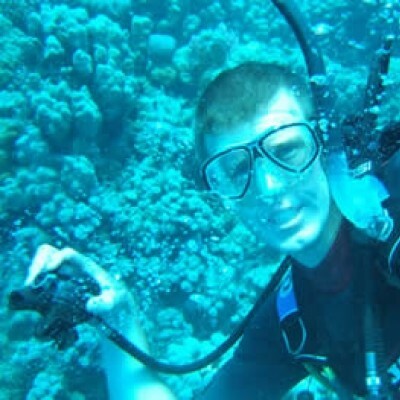 Pete dives regularly all over the Caribbean and always joins our Dive Wimbledon trips to the Red Sea. 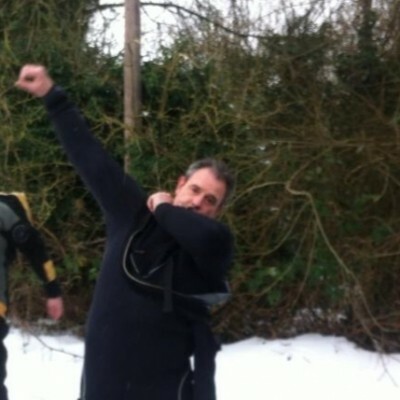 As you can see from his photo he doesn't mind diving on a cold snowy day either. Daniel is a PADI Master Instructor and Emergency First Response Instructor Trainer with over 10 years of diving experience. Having dived and taught diving around the world he is passionate about introducing new divers to the underwater world and developing certified divers to their full potential. Richard learnt to dive in June 2006 at the ripe old age of 52 when he qualified as a PADI Open Water Diver. Seven months later he passed as a PADI Advanced Open Water Diver at Dive Wimbledon where he has been ever since. 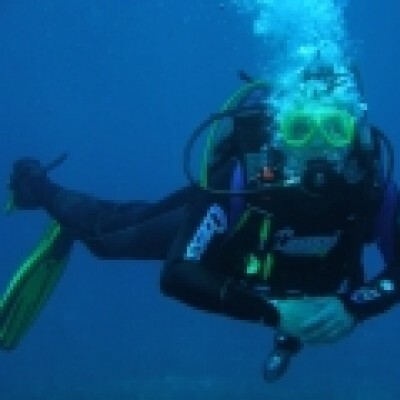 In 2010 Richard reached the dizzy heights of Padi DiveMaster. 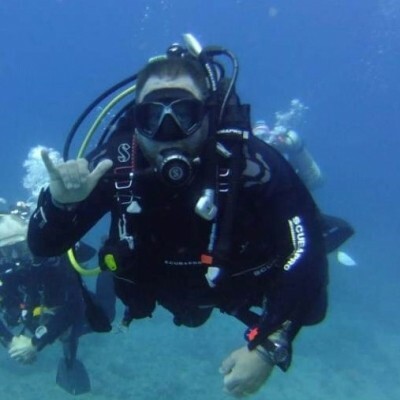 Having got the bug for continued education, he completed my Assistant Instructor course in March 2011 and went on to qualify as a Padi Open Water Scuba Instructor in May 2011 then Master Scuba Diver Trainer Certificate and eventually to qualify as a Padi IDC Staff Instructor in November 2016. 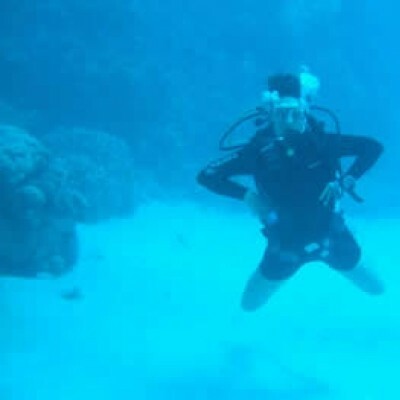 In Richard's words "It Just goes to show, it’s never too late to start scuba diving!" Thushy joined Dive Wimbledon in 2010 as a PADI Advanced Open Water Diver after checking every dive club in London. He then completed all the rest of his courses up to PADI Assistant Instructor with us. He later obtained his Instructor rating in Sri Lanka in 2013 and he has taught for us ever since. Dilara is originally from Turkey and literally grew up in the water. Her childhood was mostly free diving with her father and swimming around reefs with fish. 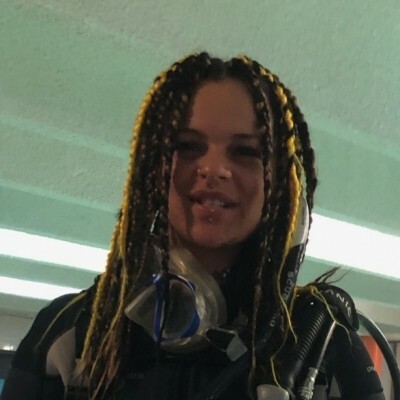 Dilara got her first PADI Certification in 2010 in Datça in south-west Turkey and since then every summer she has worked for dive schools and became a PADI instructor. "Diving is my passion therefore I love teaching scuba and how to respect the ocean while also making new friends and having fun underwater." I learnt to dive with Dive Wimbledon in London when I was 13 and from the first dive it became my absolute passion and I took on every course I could. Diving has taken me around the world from Cozumel to Iceland to Malta and Egypt pursuing encounters with Turtles and Sharks and making great friends. I love teaching diving to share the experience with as many people as possible. Sharon learnt to dive in South Africa at Aliwal Shoal and Protea Banks, famous for its Raggies, Hammerheads and Bull shark population. "Yes, I was scared-witless on my first dive when a raggie came within a metre of me! Now I love seeing them. My favourite dive locations (so far) are Bali and Sipidan, I also love searching for the little critters; nudibranchs are my favourite. Diving for me is like having a mini-holiday; it’s so good for the soul." 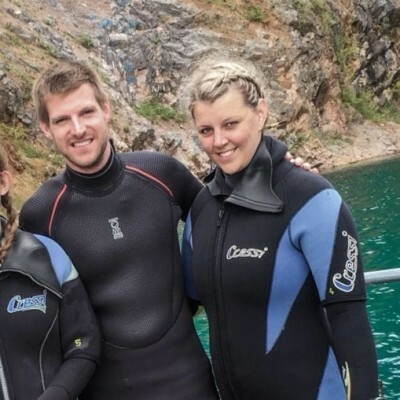 Brian completed his PADI Open Water Diver course with Dive Wimbledon in 2012. He then completed his Advanced course, Specialties and PADI Divemaster before becoming an instructor in 2015. 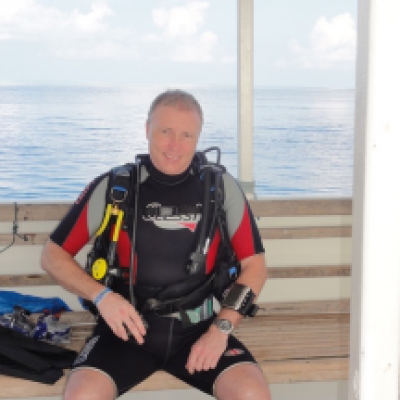 Brian is now a PADI Master Scuba Diver Trainer and as well as teaching in the UK regularly joins us on our Dive Wimbledon Red Sea holidays. To put it in Brian's words "I am still as mad about diving as I was when I started." Rupert is an experienced and well travelled PADI diving instructor with over 3000 dives and many stamps in his passport. 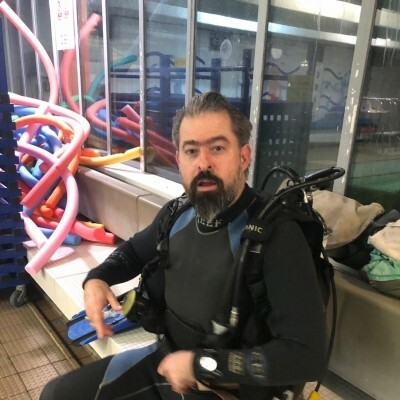 Rupert has recently traded in the joys of the Indian ocean and the Caribbean for the wonders of Putney Leisure Centre pool with Dive Wimbledon- and is as passionate about teaching scuba as ever. When he isn't teaching Rupert can be found in our office most days. I began my dive career in 2008 at the age of 21 and have never looked back. I earned the bulk of my certificates in France and Spain and my best dive holiday to date has to be swimming with Dugongs in Egypt. I love nudibranches, octopuses and coral and my dream dive holiday is to Silfra in Iceland. I'd happily brave the cold for the incredible viz! I started diving in 2006 in the UK at Wraysbury where our PADI Open Water students learn to dive. I love diving in the UK and especially around the south coast and with the seals at Lundy. I love getting students through skills that they find difficult, it’s a great feeling of satisfaction for both of us! Lex has been diving since 2009 when he passed his open water in the murky waters of Portland Harbour. He is also a qualified technical diver and will happily bore anyone to tears with gas theory given half an opportunity. Unfortunately, his ability to spot underwater critters is somewhat lacking (he has been known to miss a dolphin 5 meters away), but he makes up for it with his navigational skills (particularly when there is a pint of Camden Pale Ale placed at the exit of a dive site). Peter got hooked on diving after a DSD in Grenada in 2002 followed by the PADI Open Water Diver course in Kingston/Cabo de Palos in 2003. He then completed the rest of his course with Dive Wimbledon and has been a DM since 2006. Peter describes himself as a "Dive Wimbledon customer since DW was just a twinkle in Roger's eye"
I’m Steve or Stebe and I’m one of Dive Wimbledon’s Dive Masters. I have climbed the PADI skills sets with Dive Wimbledon and assisted with numerous course and instructors through the school. I started diving in 2013 and never looked back. I aspire to keep climbing the professional ladder and expanding my recreational diving experience. I began diving as it really is one of the most exciting truly adventurous things you can do. Dive beneath the surface you are privileged to see sunken ships, stunning coral formations and the oceans incredible wildlife. As a diver, it means wherever you go in the world, there's always an adventure to be had, from sharks and the sardine run, to diving between the tectonic plates in Iceland... travel the untrodden path and get in the WATER ! My diver training started with Dive Wimbledon in 2008, a great decision, and I have never looked back. Diving has tested my abilities to another level and no matter where I dive the freedom I get when exploring the underwater playground is unreal! 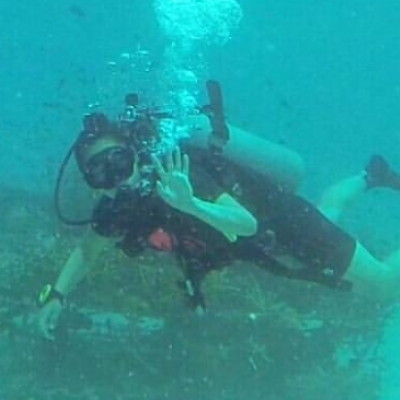 Heather was travelling in Thailand and fell in love with the world of scuba diving on Koh Tao. 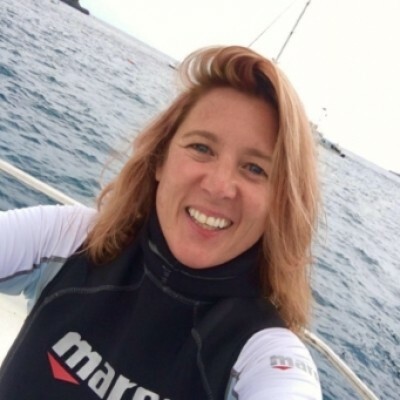 She is currently completing her PADI Divemaster course with Dive Wimbledon as one of her sporting disciplines so she can apply to join the British Stunt Register. After the course Heather would like to travel the world to explore the peaceful world under the sea.